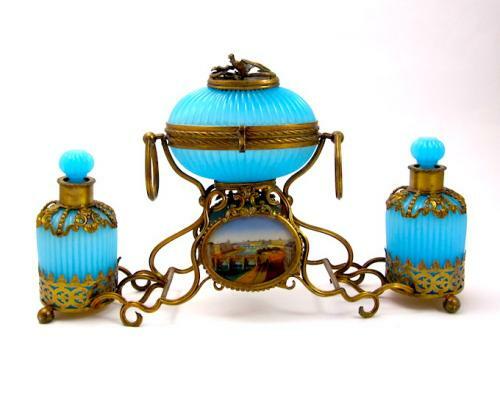 Rare Large Baccarat Palais Royal Blue Opaline Double Perfume Set with Egg Shaped Casket and 2 Large Eglomise Miniature of Paris. This is a Stunning Large Perfume Set Comprising of 2 Blue Opaline Perfume Bottles with Dore Bronze Mounts, Opaline Glass Casket with S Shaped Clasp, Dore Bronze Finial and Double Loop Handles. WOW - Large Size ! I Have Never Seen This Model and Large Size Before -Unusual !